It is generally acknowledged that teachers should be qualified in their subject specialism at least one level above what they are required to teach. Analysis of the subject qualifications of maths and English teachers currently working in the sector is contained in the Education and Training Foundation’s 2014 report, The qualifications of English and mathematics teachers, and is summarised in Figure 1. Download a PDF version of this graph here. the majority of maths and English teachers are qualified at Level 3 and above – with a high proportion qualified to degree level or above in their subject specialism (or a related subject). however, around a third have subject qualifications no higher than Level 2 (GCSE or equivalent). 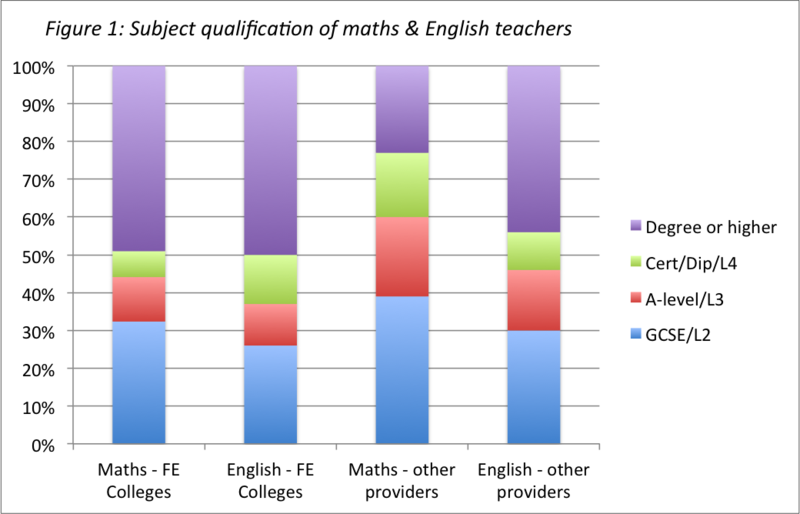 English teachers appear slightly better qualified in their subject than maths teachers; and teachers in FE colleges are rather better qualified than those in other parts of the sector – particularly with regard to maths. The survey also revealed that a significant proportion of maths teachers lacked confidence to teach different aspects of mathematics – and that there is a positive link between this and teachers’ subject qualifications. Since this survey was conducted, many maths and English teachers have benefited from the Education and Training Foundation’s Maths and English Pipeline programmes, and the Foundation Learning Online resources to improve the teaching of maths and English – including teacher’s personal maths and English skills. However, such short CPD programmes may not fill all the gaps for those with limited qualifications – and feedback from those who have completed these programmes suggests that many require further CPD and self-study, and in some cases would benefit from re-sitting GCSEs themselves. Further Foundation workforce data suggests that many organisations continue to experience significant problems in recruiting English and particularly maths teachers. This shortage is likely to increase as many young people already in the FE system are required to re-sit GCSEs once more – in addition to new school leavers. As a result, some smaller organisations might consider outsourcing their GCSE provision to a different provider, or entering into collaborative arrangements with other providers (e.g. through a local training network). Such a strategy will have advantages and disadvantages in terms of cost, quality, control and ownership which organisations need to weigh up. auditing the subject qualifications of GCSE maths and English teaching staff to identify needs for further subject enhancement. broadening this audit to functional skills and vocational teachers to identify those who could up-skill to teach GCSE relatively easily.